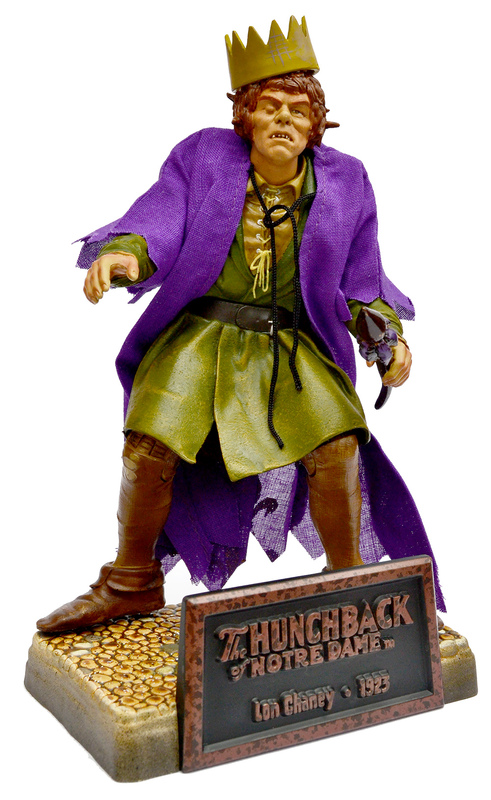 Universal Studios Monsters: The Hunchback of Notre Dame action figure by Sideshow Toy (2000) | 'TAIN'T THE MEAT… IT'S THE HUMANITY! The silent era of Hollywood established some of cinema’s greatest legends — Douglas Fairbanks, Mary Pickford and Charlie Chaplin are just some of the many names that spring to mind — but few thrilled (and flat-out terrified) those early audiences more than Lon Chaney, The Man of a Thousand Faces. 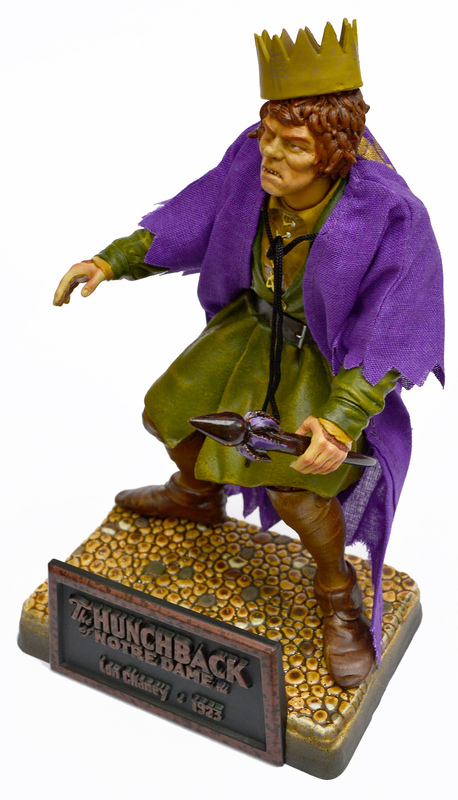 In 2000 Sideshow Toy paid homage to the silent star with an action figure based on his indelible performance as Victor Hugo’s tormented protagonist Quasimodo — The Hunchback of Notre Dame. The Hunchback of Notre Dame was released by Universal Studios in 1923 and was one of the studio’s most prestigious — and most expensive — films. Directed by silent film veteran Wallace Worsley the film literally featured a cast of thousands, and the studio built expansive sets including a breath-taking replica of the front of the Notre Dame cathedral. Lon Chaney was the natural choice to play Quasimodo, the cathedral’s disfigured and deaf bell-ringer. Using extensive make-up and prosthetics Chaney transformed himself into the tortured character; Quasimodo may not be his most famous cinematic creation — that honour surely goes to his iconic performance in The Phantom of the Opera from 1925 — but his sympathetic and compassionate portrayal of the hunchback is no less poignant. Audiences were thrilled by the film, which proved a huge success and became Universal’s most successful silent-era production. 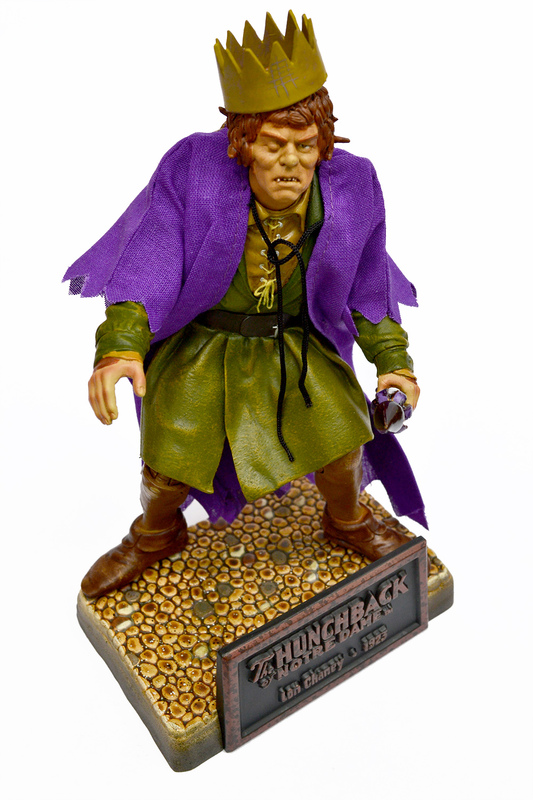 Between 1999 and 2001 Sideshow Toy released 15 action figures featuring some of Universal Studios most iconic movie monsters, and The Hunchback of Notre Dame was the seventh figure to be released by the toy company (it was actually the first figure of Series Three). The Hunchback of Notre Dame measured 8 inches in height (when standing on its base) and was made from durable moulded plastic. 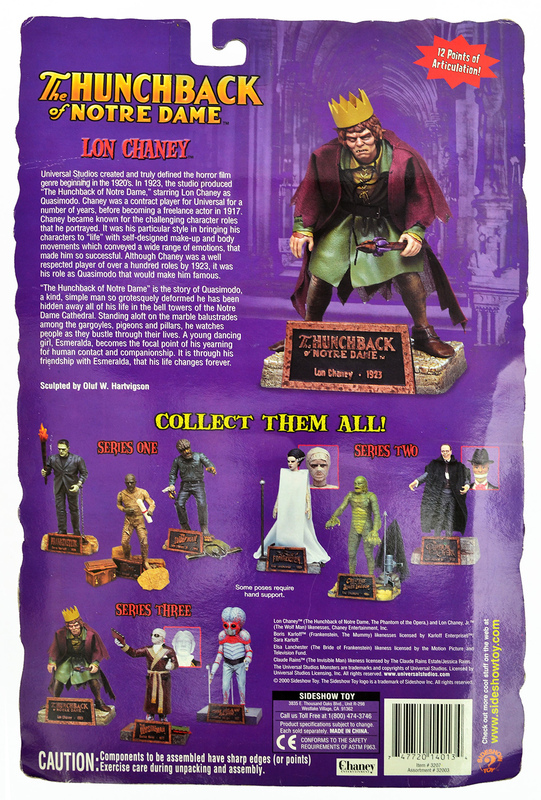 The action figure featured 12 points of articulation and shipped in a cardboard-backed blister pack, the reverse of which featured a short biography of Chaney and a synopsis of the film. Also showcased on the back were the other figures from the collection that had been released by Sideshow Toy at that time. The figure shipped with three accessories — a crown, a purple gown decorated with a gold fleur-de-lis pattern and a sceptre — all of which formed the hunchback’s King of Fools motley. Also included was a base that featured a nameplate with the film’s legend. I like the cobblestone effect on the base. The action figure was based on a sculpt by Oluf W. Hartvigson, who also sculpted the majority of the action figures from the collection. As with the other figures Hartvigson did a great job realising the character, especially the face which is an accurate reproduction of Chaney’s hunchback. The detailing on the figure’s clothes is also well done and the inclusion of a cloth coat was a nice touch. The paintwork on the figure was also of a high quality. The Hunchback of Notre Dame, all sides. 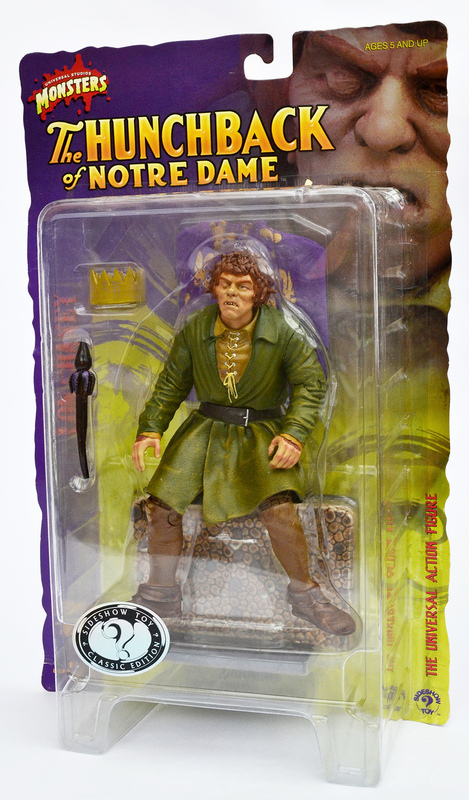 Despite the age of this figure, and the fact that it is long out-of-stock, copies of The Hunchback of Notre Dame can still be readily found on ebay at quite a reasonable price. I checked its availability recently and found BNIB copies for sale for as little as £15, which when taking inflation into account, is roughly the same price as when it was released in 2000. It’s well worth hunting down too as it’s a great action figure and well worth a place on a collector’s shelf. Next: Henry Hull’s Werewolf of London (1935) received the Sideshow Toy treatment in 2000.